IMPORTANT: This step must be done BEFORE you file your taxes. Your data must be verified to ensure what you are reporting to the IRS is correct. The resulting report is for your records and is not sent to the IRS, it is only for the purpose of helping ensure that TradeLog's data is accurate. NOTICE: Beginning with the 2014 tax year brokers are required to report options trades on the 1099-B. There are a variety of challenges that result. Brokers are exempted from reporting options opened before 2014 - however some are reporting. Brokers are allowed to report the net gain/loss for some options as the proceeds instead of reporting actual proceeds and cost basis - this can make it impossible to verify the 1099-B reporting. Brokers are required to identify Section 1256 contracts and report separately, even though there is no defined list of 1256 contracts that all brokers follow. Therefore there may be differences. 1099-B reconciliation of proceeds may be extremely difficult to impossible for many options traders. Please read about Broker 1099-B Reporting Problems and 1099-B Reconciliation Woes. No 1099-B? If you don't receive a 1099-B for one or more accounts you will indicate this when entering 1099-B information in step C below. If you have multiple accounts, reconcile each account individually BEFORE generating tax reporting. Select the brokerage account you will be importing for by selecting the appropriate Account Tab. All reconciling must be done in the individual account tabs on multi-account files. Using your broker provided 1099-B report that corresponds with this data file, enter the information required on the Form 1099-B Information pop-up. This information is essential for accurate tax filing with TradeLog. The details required will vary depending on the tax year you are working on - the image below reflects 2014 tax year settings. Note for MTM accounts: only the Total Gross Proceeds field and the Sales Adjusted for Option Premiums option will be requested for accounts marked as MTM. Enter Gross Proceeds reported on 1099-B. Typically, your broker provides this total on a summary section as Box or Line 1d. If your broker does not provide a total, you may have to total each subsection on your 1099-B, depending on how your broker reports. TradeLog needs the total of all Gross Proceeds on the 1099-B, both for covered and non-covered securities. 1099-B Details: This section allows you to change the default TradeLog settings depending on your broker 1099-B. Please see the notes and review your broker 1099-B for the specific account. Important - there are many variations between broker 1099-B forms, therefore do not assume that all of your brokers report the same. When you write an option (short option position), brokers are allowed to report the net gain/loss instead of the actual sales proceeds. This can cause your proceeds reconciliation with TradeLog to be off. Check this box if your broker reported in this manner, then TradeLog will report the gain/loss before wash sale adjustments when running the 1099 reconciliation. Note: This will not alter TradeLog's Form 8949, the software will still report the proceeds and cost basis as this provides verifiable accounting. The IRS has allowed an exemption for brokers wherein they are not required to report an option that closed in 2014 if it was opened or acquired before 2014. Some brokers have opted for this exemption, others are reporting all options. 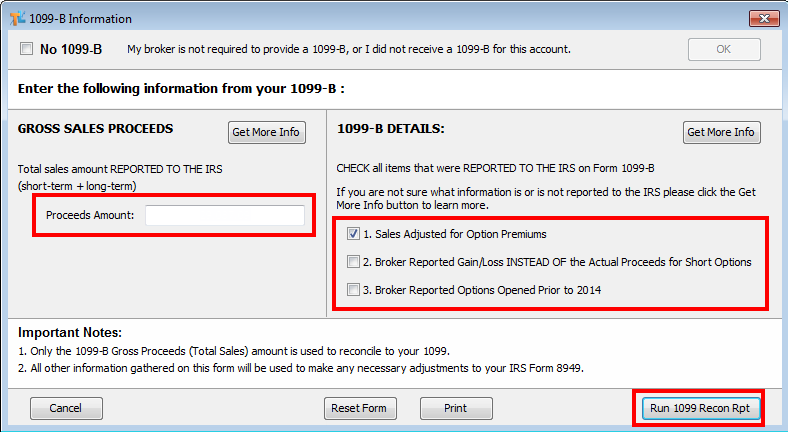 Check this box if your broker is reporting options opened prior to 2014 on the 1099-B. TradeLog will then account for these options on the 1099 reconciliation. TradeLog will report the options on Form 8949 with the appropriate box checked. Note: your broker may report those options in a supplementary section of your consolidated statement, however they will indicate that it is not reported to the IRS. When finished, click the Run 1099 Recon Rpt button to generate the reconciliation report. To clear form values, either select each field and delete, or use the Reset Form button. 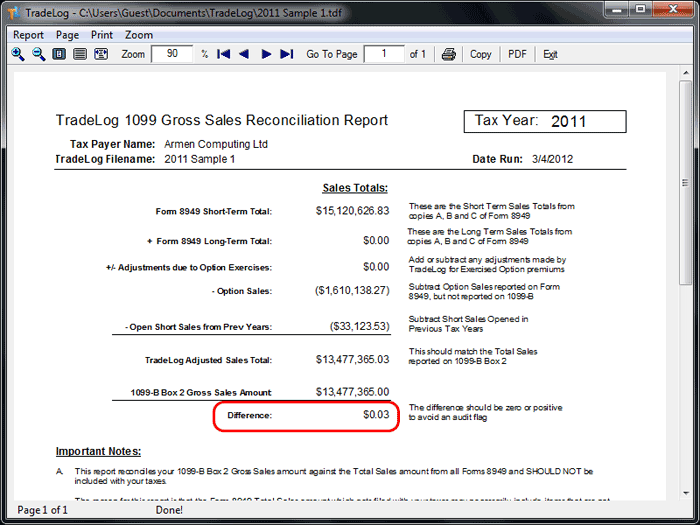 The generated report will reconcile Gross Proceeds with TradeLog reported sales for Form 8949. The difference should be close to zero or positive to reduce risk of audit. Large differences should be accounted for. Note: Only Gross Proceeds are reconciled with the 1099-B. Follow the instructions on the Reconciliation Report for understanding the totals and any differences. If a large difference exists please review the following help topic: The report doesn't match my brokerage 1099. Repeat the reconciliation process for each individual brokerage account.